I've just comeback from a weeks jaunt round Scotland starting with Glasgow, across to Edinburgh (one of my favorite cities), then all across the highlands in what was probably the best weeks weather anyone could ask for. For a moment, I thought I got on the wrong flight stepping off and being hit with the heat at Glasgow! Anyway, I thought I should share some of the weeks treats I came across, as whenever I'm visiting Scotland I am always astounded by the quality of food you can get up there. This trip didn't fail but there were some definite shining stars. The best food I found was the fish on the west coast. You would pass little boats bringing in the fish and shellfish in the afternoon, ready to be served in the evening, so it doesn't get fresher than this. One of may favorite spots was Plockton, a very pretty little fishing village although a bit odd as there are palm trees dotted around which I don't immediately link to Scotland. Regardless, it was one of the nicest places we visited and on a nice day well worth the afternoon hours spent overlooking the bay with a local ale in hand. 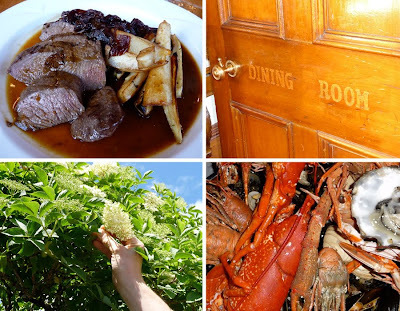 We decided to eat at the Plockton Hotel and pub, canceling our reservations at the newly opened Shores restaurant (sorry!) as the menu at the pub seemed more simple and honest and I'm doubly glad we switched as it turns out they made it into the finals for the Seafish Seafood Pub of the Year Award. 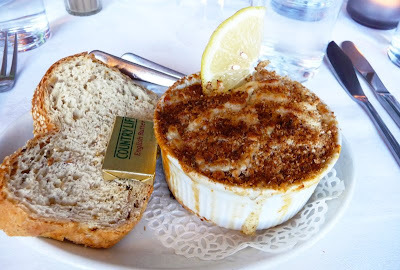 I had their Plockton Smokie, which was baked, flaked smoked mackerel layered with cream, cheese & tomatoes. Utterly divine. I always worry about things with cream as it's not really my thing but here it was hardly distinguishable, soaking entirely into the fish to soften and sweeten it. I loved the tomato on the base which was particularly delicious. As I saw the boats bringing in the days catch over the road through the windows, I was in the mood for more fish and chose the local salmon but tried some of the haddock and pan fried herring in oatmeal too that my fellow diners ordered. Everything was faultless, particularly the herring and just really simple. The other diners in the small room all seemed to agree as all I could overhear from each table was praise. The seafood stew on the next table looked amazing. Whilst we were visiting the site of Europe's oldest tree (rock and roll people, rock and roll) we stumbled on the Fortingall Hotel, which was totally unexpected as there was little else around in the remote village. 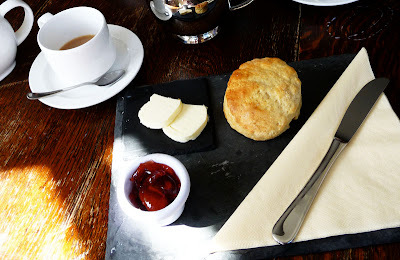 They managed to rustle us up a quick cream tea that was very welcome amongst their beautiful surroundings and furniture which, when you look closer you will see is made with bits of antlers and feathers and things. This is a real hunting, fishing, shooting kinda place and I loved all the tweed with the country house glamour. Shame dinner wasn't served for another couple of hours because I bet it would have been good looking at the menu and quite reasonable too. Next time maybe. 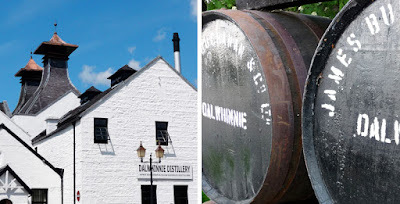 We drove to the barren plains of Dalwhinnie to have a gander round the distillery there. One of the highest distilleries in Scotland it produces the 'Gentle Spirit', a nice chilled out whisky for my novice taste buds. They make good use of the water from the Lochan an Doirre-uaine and they used to get the peat from the bogs nearby. It amazes me that only six people work here on shift rotation to produce all the whisky that lies around there and other locations around Scotland "sleeping" in the barrels. I wasn't allowed to take any pictures here but I loved the massive coppers stills which made me feel like I was in Willy Wonka's factory. The did let me stick my head in the mash tun to get a lung full of the barley being swilled around. I sampled a dram (because it would be rude not to, right) of their standard 15 year old which could easily turn me onto the stuff. A very easy going whisky and fun to compare to all the others, from the light coastal whisky from Oban (although I couldn't detect the apparent salty aftertaste) to the dark, heavy stuff for you hardened drinkers, the name escapes me as I was a bit floaty at this point! Next time... More fish at the amazing Loch Leven Seafood Cafe and the oddness of Sheena's Tea Hut at Corran.